Though designed over a hundred years ago for the U.S. Army, the .45-caliber Colt-Browning semi-automatic pistol remains tremendously popular among handgun shooters and collectors, especially in the United States. Millions were made for various military services and for the civilian market during the 20th century A.D., and numerous manufacturers continue to produce their own modernized versions, along with an almost endless array of parts and accessories. A virtual cottage industry of gunsmiths also supports the customization, modification, repair, and upgrade of both the relics and the modern pistols. by M. D. Van Norman. The Argentine m1927 is an example of the widespread popularity of the Colt-Browning design. I suspect that there are two primary reasons for this enduring popularity. First, the .45-ACP cartridge is perceived to be a potent handgun round, which appeals to shooters who obsess over the “stopping power” of their firearms. Second, the short, single-action trigger makes accuracy with the pistol fairly easy to achieve.1 Add in the long service life of the U.S. m1911 series and the irrepressibility of American pride, and you have a recipe for success. While my assessment of the Colt-Browning platform may be more objective, I can still appreciate the innovation represented by the basic design, constrained as it was by what were essentially 19th-century military specifications. The idea of building my own version was also very appealing. 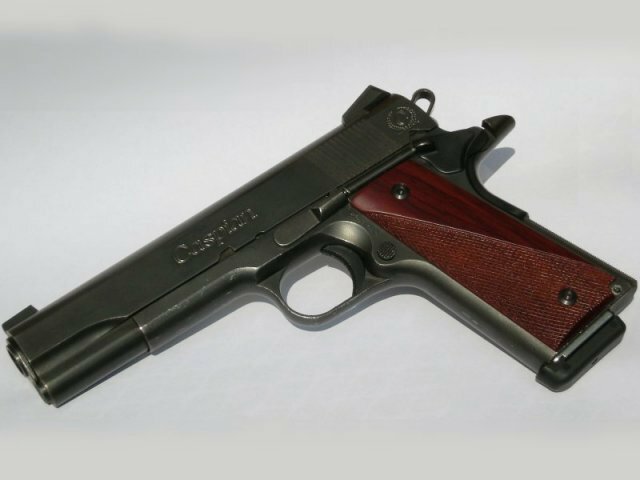 Well-worn U.S. m1911s can easily fetch $1,000 or more, so when the opportunity to purchase a comparatively inexpensive Argentine m1927, Sistema Colt, pistol presented itself, I jumped at the chance. 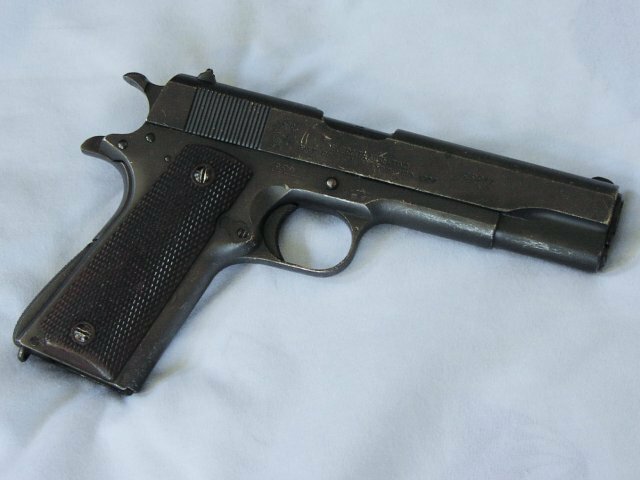 The Argentine model of A.D. 1927 was a licensed copy of the Colt system (U.S. m1911A1), though the first 10,000 units were manufactured in Connecticut. These pistols were produced until A.D. 1966 and were almost completely identical to their U.S. military counterparts.2 My m1927 was made in Argentina in A.D. 1951 and exhibited plenty of scratches and cosmetic wear, but mechanically it appeared to be in excellent shape. At about seven yards, I was still able to place shots within a three-inch circle with my unmodified m1927 pistol. Once I found the time, I headed to the local shooting range to give my m1927 a quick function check with a variety of ammunition, including round-nose, flat-point, and hollow-point bullets. I went through four magazines without any real trouble. I had one failure to feed with the hollow points, but that appeared to be a problem with an unidentified magazine. Accuracy was fair, given that I was out of practice and that the pistol suffered from a heavy trigger and poor military sights. 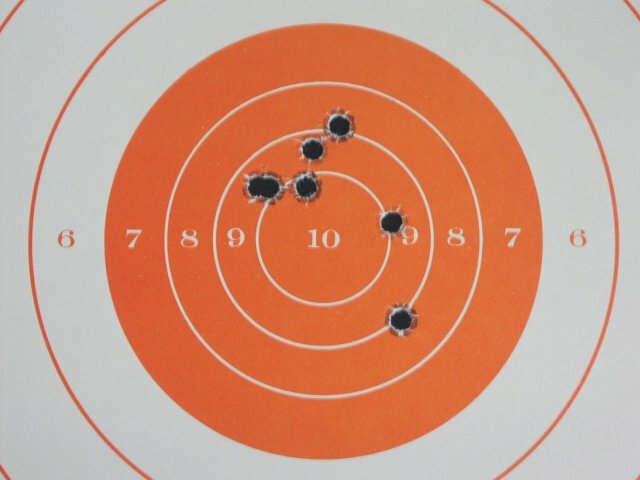 I was able to group my shots within a three-inch circle at defensive ranges. The shots were consistently high but centered horizontally, which was very encouraging. Compared to the baseline performance of my .45-ACP SIG-Sauer P220, however, the m1927 still needed a lot of work. 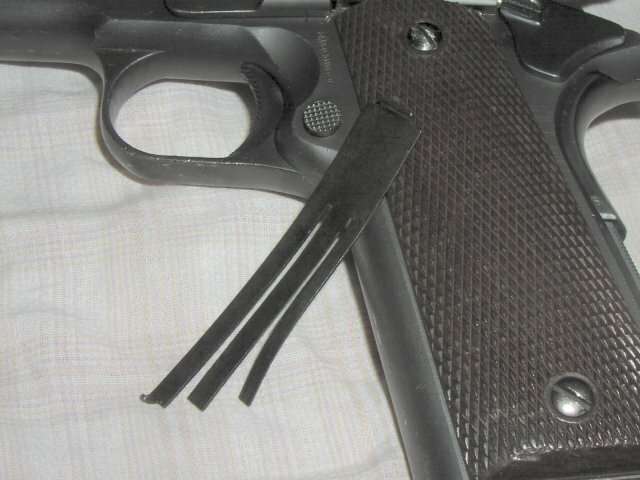 Despite a lot of mostly cosmetic wear on the outside, my m1927’s internal parts were in very good condition. 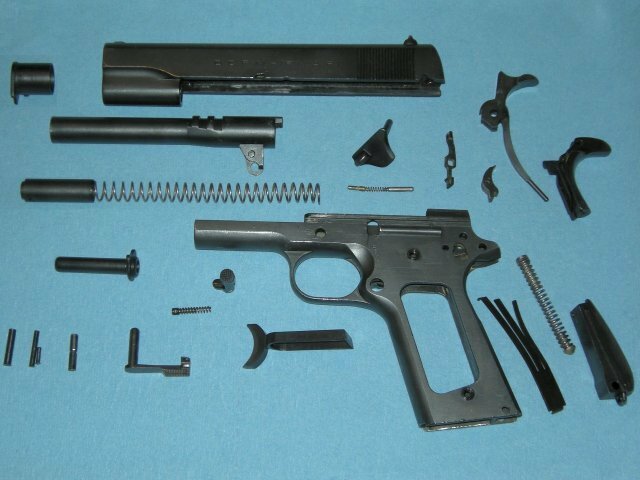 My next step was to completely disassemble the pistol for a detailed inspection and a thorough cleaning. I used a few simple tools for the job, though it is said that the Colt-Browning pistol can be used as its own toolbox. Once I had it apart, I was pleased and a little bit surprised to discover that the gun’s internal parts were in perfectly serviceable condition. There was some honest wear, but nothing was close to being worn out. I decided to rebuild my m1927 into my vision of a combat pistol, which meant it would need to be easy to hold, aim, and fire. 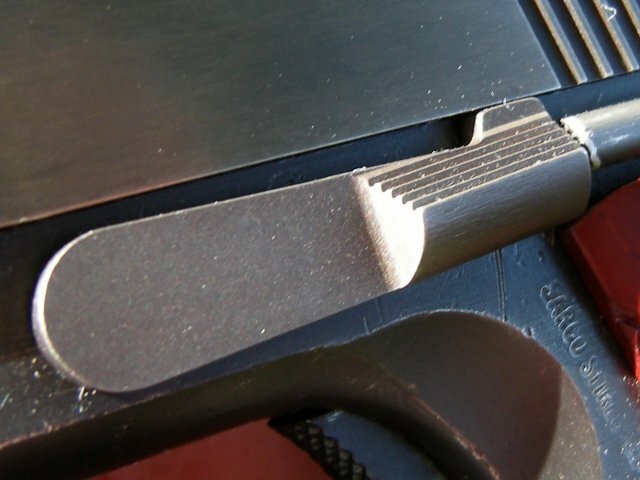 The grip profile would have to be reduced, the sights would need to be improved, and the pull weight of the trigger would have to be lightened. As it happened, I tackled the heavy trigger pull first. Replacing the sear spring brought the trigger pull down to an acceptable weight. While mercifully short, the m1927’s trigger still required a substantial amount of force to release the hammer. This didn’t hurt leisurely, close-in accuracy at the shooting range too badly, but it certainly made the pistol more difficult and less comfortable to fire. I wanted to bring the pull weight down to about four pounds, light enough to shoot very easily but still heavy enough to require intentional effort. With some effort, I installed a flat mainspring housing to reduce the size of the m1927’s grip. At the same time, I started to minimize the grip profile by replacing the arched mainspring housing with a flat one. 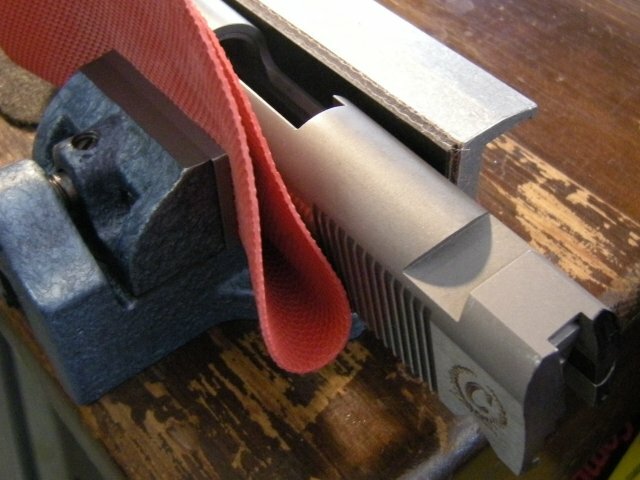 I purchased a drop-in housing made by Wilson Combat and quickly realized that I would still have to fit it to my pistol by hand to prevent it from binding the grip safety.4 My existing hobby files weren’t well suited for the task, but I was able to get the job done after a few hours of diligent work. To complete this process, I bought a pair of slim grip panels from the Cocobolo Supply Company. Their installation wasn’t any easier. The original grip-screw bushings were staked in, so I had to remove them carefully to avoid damaging the frame. Using a special driver bit from Brownells and applying slow but steady force, I was able to get the old bushings out successfully. Once the new bushings were in place and secured with Loctite Threadlocker, installing the slimmer stocks was easy enough. Half-checkered, “ranger”-style panels retained the functionality of checkering without giving the pistol the appearance of either a military sidearm or a presentation gun. Combined with the flat mainspring housing, they reduced the grip profile by a quarter of an inch in circumference. Compare the slimmed-down m1927 on the left to the unmodified pistol on the right. The next improvement was significantly more expensive. A combat handgun should be able to be aimed quickly and effectively even in low-light conditions, so tritium night sights were a required upgrade. I lacked the experience and the equipment needed to properly install sights on a Colt-Browning pistol, so in addition to buying the sights, I would need a professional gunsmith to install them. Assembling the new slide required quite a bit of file work on the firing-pin stop and just a touch on the extractor. Everything seemed to fit together correctly, but I eventually made another trip to the range to verify this. Using new magazines, I went through the same variety of ammunition as before without any trouble whatsoever. The new Caspian slide required some additional fitting to match my pistol’s frame more closely. However, the Caspian slide was not a perfect match to my m1927 frame. There was a slight overhang at the rear, so I decided to shorten the slide for a better fit. This meant I needed to buy more tools, but eventually I marked the slide, loaded it into a table vise, and went to work with a mill file. I worked very slowly in order to maintain the original contours. After each pass of my file, I re-inked the back of the slide as a reference. In this manner, I eventually cut my way down to the desired depth. I finished the process with a couple passes from a hobby file and the judicious application of fine sandpaper. My m1927 saw very little change in performance after the initial modifications. Meanwhile, I re-installed the original slide and made another trip to the range to see how well my previous improvements performed. The results were really no better than my first outing but were still acceptable. However, after seven magazines, my right hand came away bloodied by repeated blows from the long hammer spur … which made me reconsider my $5.00 trigger job. 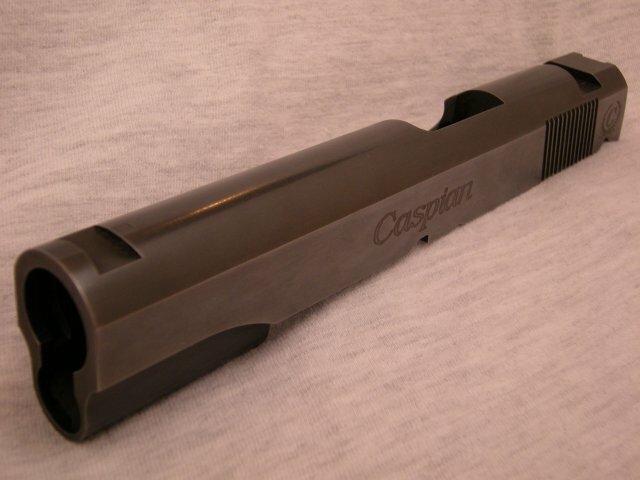 The Caspian slide had an acceptable finish after two applications of cold bluing solution. With the rear of the slide and the frame blended to my satisfaction, I prepared the slide for finishing. I used fine sandpaper to smoothen the steel, to soften the sharp edges, and to remove a few small scratches. I followed this with my trusty pot scrubber, burnishing the surface to a pleasant sheen. I then blued the slide in a two-step process. First, I heated the slide in the oven and quickly applied a coat of Brownells Oxpho-Blue with cotton patches. I let this cure overnight, but after I cleaned and burnished the steel again the next day, I noticed that the dark-gray finish had some prominent streaks. For the second coat, I switched to Birchwood Casey Super Blue. This left the slide a deeper black, but the streaks were still visible upon close inspection. Since I wasn’t trying to win a beauty contest with this pistol, I decided that this was good enough, packed up the slide, and shipped it off to Novak Design for sights. I installed the Caspian slide, now equipped with Novak low-mount night sights. Two weeks and $200 later, my slide returned with tritium sights in place. I chose the bar-dot configuration on the theory that the different markings would enable quicker acquisition and alignment of the sights under stress. The installation job itself appeared professional and secure. I was ready for another trip to the range, but the thought of that long hammer spur biting my hand continued to bother me. I further upgraded my FM-Caspian m1927 with a Cylinder & Slide trigger-pull kit and a King’s grip safety. So I installed a Cylinder & Slide trigger-pull kit that I had previously blued. Rated at four pounds, the kit gave the pistol a crisp, relatively light trigger pull. I paired the new hammer with a King’s Gun Works grip safety, though I had to tweak the sear spring to keep the safety from flopping about. 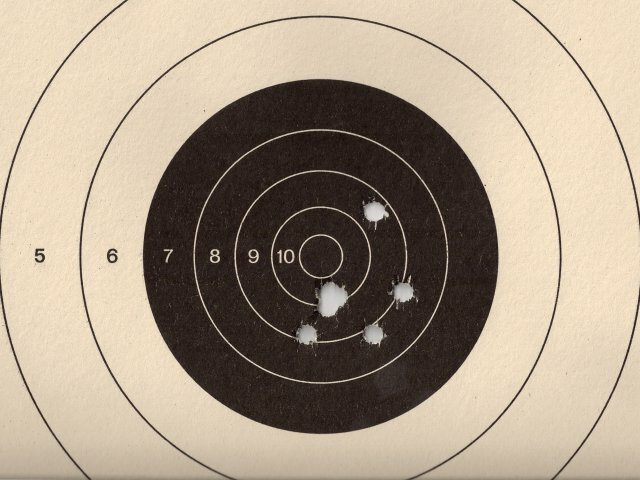 At 25 feet, I shot a 2.25-inch group with my FM-Caspian. Note the four-round “cloverleaf” in the 10 ring. Once the weather cooled down, I took advantage of a furlough day and headed to the shooting range. While I wasn’t expecting any major improvements in accuracy, I did manage a 2.25-inch group with premium Winchester hollow-point cartridges. After the hollow points, I tried flat-point and round-nose ammunition in a variety of new magazines. I experienced only two minor problems. 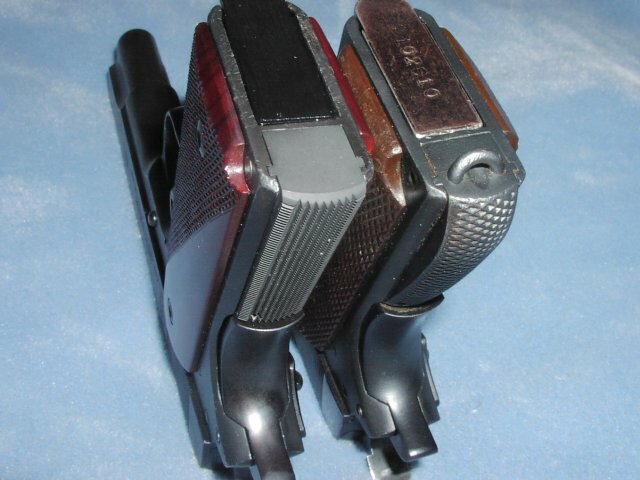 The slide twice failed to return to battery with Ed Brown magazines and also failed to lock back on Chip McCormick magazines. The former problem will probably resolve itself after a couple hundred more rounds, as the new components wear into the the gun. The latter is probably indicative of a worn slide stop, which I will eventually have to repair or replace. But my hands came away unscathed. 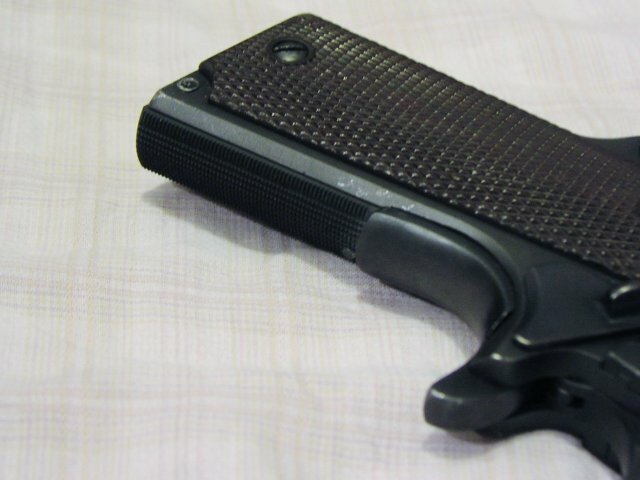 I swapped the original slide stop for a heavy-duty replacement from Evolution Gun Works. After some experimentation, I decided to change out the slide stop. Evolution Gun Works provided a heavy-duty replacement, which seemed to resolve the lock-back problem. Another trip to the range validated this conclusion, and I was able to run through 10 different magazines from four different manufacturers without a single malfunction. I was also pleasantly surprised when I turned in a tight group with my first magazine. Other than making the pistol easier to shoot, I haven’t done anything to intentionally improve its accuracy, but this group showed that the gun can do its part when I do mine. However, my shots have been drifting to the right and are no longer consistently centered. This is probably due to incorrect finger placement on my part, but I can’t rule out a mechanical cause without further testing at the range. 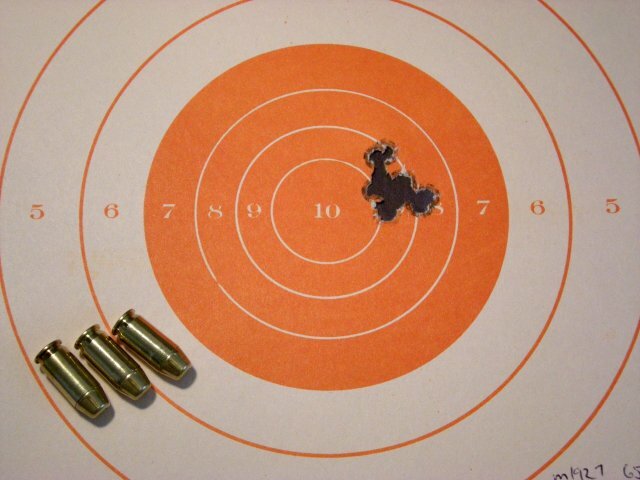 This eight-round, 1.06-inch group demonstrated the potential accuracy of my FM-Caspian pistol. After more than two years and 500 extra dollars, this project is effectively done. Without making any permanent modifications, I transformed a well-worn relic into a modern combat pistol,6 ready once again to defend life and liberty. During this process, I gained a new appreciation for the Colt-Browning platform embodied by the U.S. m1911 series, by the Argentine m1927, and by the host of commercial variants still being manufactured today. In fact, the enduring popularity of the 1911-style pistol turned out to be its best feature. The wide variety of replacement parts available on today’s market gave me the opportunity to build the pistol that I wanted. Even the lament from Col. J. D. Cooper that I quoted at the bottom of this page no longer applies. 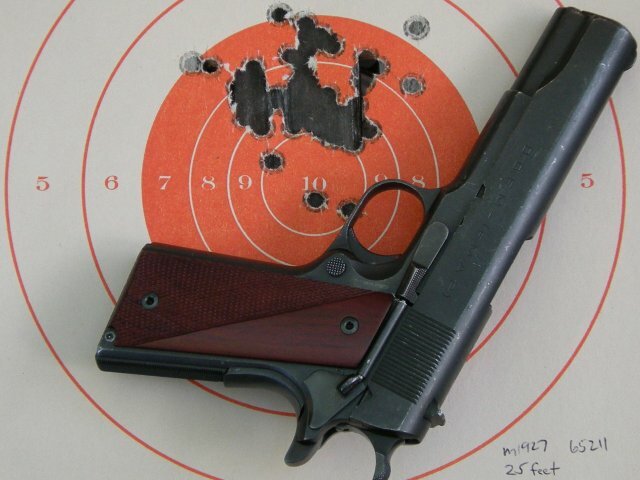 The first time I fired a 1911-style pistol, I was quickly shooting the centers out of my targets at seven yards, albeit with a well-tuned Smith & Wesson Performance Center model. Besides their different markings, there are supposedly only two external, cosmetic differences between the U.S. m1911A1 and the Argentine m1927 pistols. The light sear spring worked very well on this pistol, but I have had less spectacular success on other examples. To achieve a similar result with an earlier m1927, I had to install a drop-in trigger-pull kit from Cylinder & Slide, which was significantly more expensive. Pressing the grip safety disengages the disconnecter, allowing the trigger to act on the sear, which holds the hammer in the cocked position. 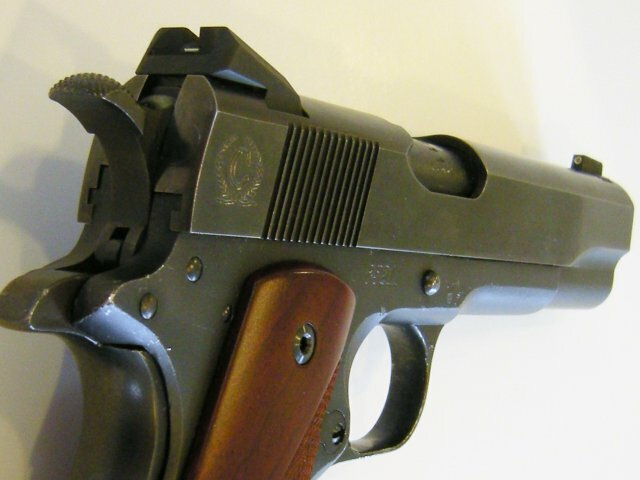 The basic Colt-Browning design lacks a firing-pin block, so an unmodified pistol can potentially discharge if dropped. The danger is remote, but simple precautions should be taken to mitigate this risk. Such a weapon doesn’t exist, except in the narrowest of contexts. Conventional wisdom holds that no one would choose to fight with a handgun, but civilian shooters also won’t find themselves with select-fire carbines and on-call reinforcements.